People love the look of wood, but they don’t like the maintenance. In addition, wood is at a higher risk for damage in commercial settings where people are rushing around in high heels or very dirty shoes. However, manufacturers like Nalboor Tiles have discovered a way to deliver the warmth of wood with the greater durability of porcelain. The only question you need to ask is if you’ll go with natural stone floors for your business or ceramic that looks like wood. When all other factors are equal, cost can sometimes help you make the final decision. However, the cost of wood-looking tile is comparable to entry-level natural stone. Both are very durable, and they each start at about $2 per square foot. Installation cost is even comparable as each product requires a certain amount of skilled labor to properly mount it. However, while wood-looking tiles typically top out about less than $4.50 per square foot, natural stone can cost more than $15 a square foot for the high-end tiles. If you’re working on a luxury resort for the rich and famous, then you may find that only the finest natural stone tiles will do. When deciding between natural stone and the look of wood, keep in mind that wood has a more casual feel. If you’re building a high-end restaurant, then the natural stone is probably the right choice. Natural stone has a refined look that people will appreciate, but wood will invite them to relax and stay for a little while. Rojo Alicante gives any space a luxurious feel that wood cannot quite recreate. However, the Montreal Maroon wood-looking planks perfectly mimics the look of old barn wood, and that may be the perfect option for your casual boutique or hair salon. If you want to make a space brighter, then nothing compares to natural stones in shades of white or ivory. Vanilla Oro marble tiles reflect light to make any room feel larger and more welcoming. Champagne White Limra Limestone also has a translucent quality that makes spaces seem brighter. While you can find light colors in the wood-looking tiles, they won’t quite reflect the light the same way. Calacatta Gold marble is a legendary stone that’s typically shipped in from Italy. The white background contrasts beautifully with gold and gray veining that travels throughout the stone like a river. It’s a great choice for countertops, and you may want to use it as the floor in restrooms of a country club or five-star restaurant to brighten the spaces and give them a classic finish. However, if you have your heart set on the look of wood and want a light color, then consider the Alberta Cream wood-looking planks. They have a gold and brown grain printed within a field of cream to ivory, and they’re perfect for almost any modern design theme. Natural stone tiles blend seamlessly into each other, but you can use wood-looking tiles to form a pattern on the floor, wall, or even countertop. Set them in a herringbone to take any room to a higher level. It’s an easy way to add interest to a space, and you can even do a patterned area inside a larger border to highlight key areas. When choosing the flooring, consider how dirty the surface is likely to get. Retail establishments typically see a good deal of dirt tracked in, so you need to choose a material that’s easy to clean. 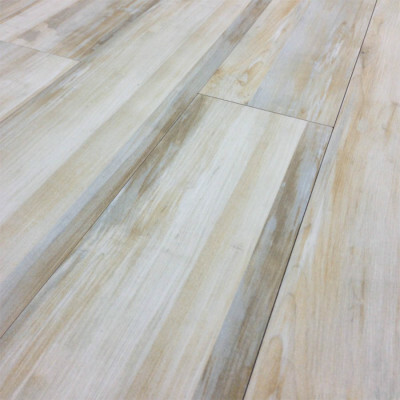 Both natural stone and wood-looking porcelain tiles can have some little crevices and ridges on the surface. These may catch dirt and be more challenging for the cleaning crew. However, both flooring types also have options that are completely smooth. These will be easier to clean since there’s nothing for the dirt to catch on. Both marble and wood tiles are installed with minimal or zero grout lines, so you won’t have worry about cleaning those spaces. You can sweep the surfaces and go over them with a damp mop to remove the dirt and keep everything looking great. Both materials can handle a range of environmental conditions. Unlike natural wood, they won’t fade in the sun or become discolored under rubber mats. You can install them in the foyer of your law firm or have them put in the bathroom because they can handle regular moisture exposure. If you’re putting floors down in an area that will get wet, see cold temperatures, or routinely be subjected to direct sunlight, then natural stone and porcelain wood-looking tiles are both smart choices. Ceramic tiles are made using completely sustainable, natural materials. This makes them an eco-friendly choice that you can feel good about. They’re crafted using clay, feldspar, and quartz. Natural stone is also considered a renewable resource, but it still needs to be mined, finished and transported. For this reason, many people feel that the wood-looking tiles have a smaller carbon footprint and are easier on the planet. Whether you go with natural stone or wood-looking tiles, you’ll feel great knowing that you’ve saved several trees by making the eco-friendly choice. When choosing between natural stone and wood-looking ceramic, it’s largely a matter of personal preference. Consider whether you want a casual feel or high-end look to help determine if wood or stone is the right choice. Both materials are durable enough to withstand commercial applications. They also both have styles that are easy to clean and designed to look great for years to come. Choose the option that will work best for your client while fitting in the projected budget. Call Nalboor Tiles at 305-501-4548 for the selection you need and the quality that you expect. You can also use our online contact form and order a free sample today.